The Try Sailing programme has hit the ground running in 2016 with 67 venues throughout the nation signed up to run events and programmes that give newcomers a chance to Try Sailing or Windsurfing, as well as Try Racing in collaboration with ICRA (Irish Cruiser Racing Association). The feedback from newcomers is tremendous and this spell of good weather is certainly helping to kick off the 2016 sailing season well. Open Days, BBQ’s, fun racing, Surf n Turf, School Try Sailing, Adult Coaching programmes throughout the country are introducing new sailors, new crew and new membership nationally. Wexford Harbour Boat and Tennis Club and Bantry Bay Sailing club ran very successful “Surf n Turf” days with their the local Rugby clubs – try tag, try tack. The post event social went down well too! Bray Sailing Club ran an Adult Try Sailing programme with theory sessions, racing, cruising and bbq. The club are also providing a programme of SkillBuild sessions for new members throughout the summer. National Yacht Club are running a successful Adult Try Sailing programme of beginner coaching and introduction to Try Racing. Lough Ree Yacht Club pulled out all the stops to welcome Try Sailors out on the lake in glorious sunshine. 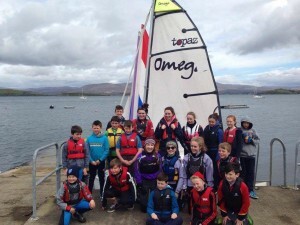 Bellacragher Boat Club was one of the first events back in May and offfered dinghy and catamaran sailing, followed by a beach bbq for locals to get out and give it a try. Kinsale Yacht Club Open Family Day with introductions to Sailability, rigging for kids and cakes galore for everyone. Galway Bay Sailing Club put on quite a day with taster sailing and great bbq. Rush, Carlingford, Courtown, Blessington, Sutton, DMYC, Poolbeg, Dungarvan, Skerries, RIYC, Malahide, Wicklow, Bray, Greystones, Bantry and Kinsale Yacht Club have all run School Try Sailing days with the support of their Local Sports Partnerships. There are more Try Sailing school sailing events throughout the country in June. Cullaun Sailing Club fun and craic in dinghy sailing boats. Malahide Yacht Club Cruiser Try Sailing Evenings – no experience necessary. Royal Cork Yacht Club Family open day Sunday June 5th. ISA Try Sailing Invitational Challenge at the Volvo Cork Week at Royal Cork Yacht Club in July – a chance for clubs around the country to enter a team of new sailors in to this high profile event. See www.trysailing.ie to find a venue near you.